That's right, dear friends, we have arrived at First Kick: 2015. 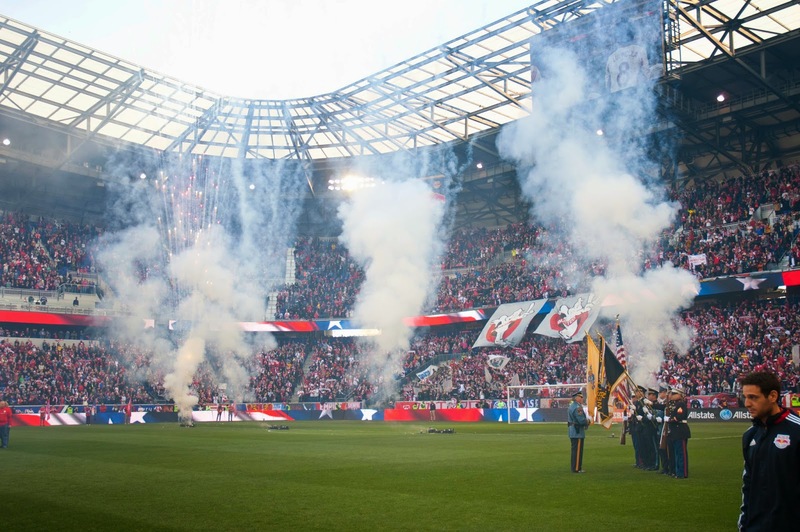 By any reasonable measure, RBNY had a successful, if ultimately unsatisfying 2014 season. A tough loss at New England, where the Red Bulls were without the services of striker extraordinaire Bradley Wright Phillips due to yellow cards, prevented the team's second ever MLS Cup appearance. But making it to the Eastern Conference final was a great accomplishment that had the added bonus of a great loss/win in DC that knocked out the Scum out of the playoffs. But that was last year and an almost entirely different team. As we all know, Ali "Boumaye" Curtis and his BFF Jesse Marsch are now in control, having unceremoniously ousted fan favorite Coach Mike Petke. On the pitch, RBNY fans won't see EZ Does IT, Ambroise "I Was Never Under Contract" Oyongo, Jamison Olave, Ibrahim Sekagya, and other familiar faces. Looking past the Petke-related ire for Curtis, fans will see that he has done a pretty respectable job bringing in new faces. Sacha Kljestan, Felipe Martins, Ronald Zubar, Mike Grella, Sal Zizzo and Leo Stolz are a few of the additions who we all hope will prove even the most intransigent naysayer wrong and get the team into the final this year. So with all these changes, what does the Viper's Nest Expect, Fear and Hope? Great question, and it's how we're kicking off the blog this season. EXPECTATIONS--What should happen this year? The Big Viper: "I expect RBNY to make the playoffs. I don't think that's too much to ask for as 6 teams from each conference make the playoffs. Henry is gone, yes, but we still have last season's Golden Boot Winner. Also, the midfield has (theoretically) gotten way more creative w/the additions of Sacha, Felipe and (Hermann Trophy Winner) Leo Stolz. You add Lloyd Sam and Peguy to that lot and there will surely be many scoring opportunities for BWP and whoever his strike partner/s may be. A wise addition to our DP roster over the Summer will go a long way to ensuring another Playoff appearance for our team." Matt Conroy, aka Who Shot Sam: "I expect that we will add a DP over the summer. It's nice to think we could win on the cheap but I think they will realize by June that more talent is needed, especially up front. If Wright Phillips gets injured or suspended the replacements don't look too great - Abang, Grella. Maybe they've been looking for a player and just haven't found him yet but we're paper thin at forward." Tom Faust: "I expect the team will actually deliver on Curtis and Marsch's promise of playing uptempo soccer. We've all heard this before, but I think we've seen glimpses in the preseason and the boys seem to be aligned and committed to the vision. RBNY seems to have the horses, now it's time to run." Viper: "I fear the Red Bull Powers That Be will fire Mr. Marsch if he doesn't have immediate success. We'll then be subject to another blowing up of our team and the Cup failure will continue. I've liked the moves that have been made which so far. The intent is there to transform this team from a very direct style, with (mostly) no creativity in the middle (dating back to the Juan Carlos Osorio days) to a team where the creative options are plentiful. Will RB management let this play out or will Marsch be shown the door faster than the 1 1/2 years that Bruce Arena lasted here? That remains to be seen. Matt: "I fear that we will get off to a poor start and the season will devolve into a lot of infighting between fans and the front office. We start on the road again, and our first home match is a big rivalry game. How will people react if we start 0-3 or 0-4? Not too well, I fear. It could make the Town Hall look like a child's tea party." Editor's note: That's crazy. How can you think such a thing would happen? Tom: "That MCFCNYCFC dominates us and excels in their debut season. Look, I know that I should be focused on what might go wrong at RBNY, but after all the smack talk over 2+ years and RBNY's flailings for 20, what happens up in the Boogie Down this year will directly reflect on the Red Bulls' success. As much as it pains me to say so, I can see a scenario where we don't fill RB Arena for MCFCNYCFC and then they beat us at home. Twice. On top of that, if MC Light is atop the East and, god forbid, makes a run at the cup, Red Bull Nation would implode. " HOPES--Where do you hope Red Bull beats the odds this season? Viper: "I hope RBNY wins the US Open Cup. Why not? If Mr. Marsch meant what he said on the Seeing Red NY Podcast (about taking the Open Cup seriously) and what the taste of such Cup success can do to a player's desire for greater Glory, there is no reason we can't field our starting 11 for every USOC game all the way to the Final. MLS Cup be dammed, these guys should be gunning for USOC Glory this year." Matt: "I hope that the back line holds together. Curtis and Marsch are relying on a lot of journeymen to get it done - guys like Zubar and Perrinelle who are basically cast-offs from Ligue 1. Maybe they'll get the job done and cut down on our tendency to surrender penalties and commit defensive brain farts at inopportune moments. Still, defense is a major question mark." Tom: "I hope to Zeus that Felipe Martins shows 75% of the brilliance in his highlight reel on the pitch. Then I can stop moaning about the lack of vertical passing, and won't have to listen to Big Viper whine about our need for a creative #10. To see the team taking passes in stride and running onto through balls, rather than playing with their backs to the goal and allowing the opposing team to set up a strong defense, would be a dream come true." So, there you have it. Now it's time to break some Sporks in half! COME ON YOU RED BULLS!! !